One of the best and easiest ways to save money on heating and cooling costs is by insulating your windows. From caulking and weather stripping to installing window screens/films and thermal curtains, we’ve put together a useful guide for insulating your windows. AN easy way to tell if your windows are leaking precious air is by holding up a lit piece of incense or thin piece of toilet paper around the perimeter of your windows. You can also do the same for your doors. If the smoke or paper begins to move erratically, you have an air leak nearby. 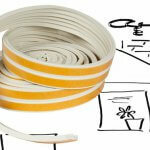 Foam Tape – Use on the tops and bottoms of window sashes, door frames, and even attic hatches. With self-adhesives, they are inexpensive and easy to install; however, they should only be installed wear little wear is expected. V-channel – Used for the sides of double-hung or sliding windows and the tops and sides of doors. They will last a long time and are invisible once installed, however, they may create too much resistance. Felt – Used around doors, door jambs, and window sashes. They are cheap and easy to install, but they only last a couple of years. Do not use felt weather stripping where they could be exposed to rain or moisture. They are visible after installation. Door Sweeps – Made from aluminum or stainless steel and attached to plastic, vinyl, sponge, or felt brushes, they should be installed at the bottom of all your exterior facing doors. They are easy to install, but could cause damage to carpets. Draft Snakes – If you have rugs or carpet that may get damaged from door sweeps, draft snakes are a good alternative option. You can make them yourself with a tube of fabric and dried rice or purchase them online or at a local store. In addition to doors, you can also use draft snakes at the bottom of window sills. We recommend: high-quality silicone rubber weather stripping for a more permanent and better looking solution. For this type of weather stripping, you will need to use commercial-grade neutral-cure silicone caulk for the adhesive. Once you choose the weather stripping that works best for your windows and doors, measure twice before cutting the weather stripping to size. Also make sure you remove all of the old weather stripping and clean the surface before installing the new weather stripping. Make sure the area is completely dry before proceedings. If you choose the silicone rubber tubing weather stripping solution, clean the service area with toluene, xylene, or MEK. 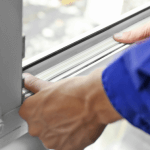 Click here for further instructions on installing weather stripping around doors and windows. 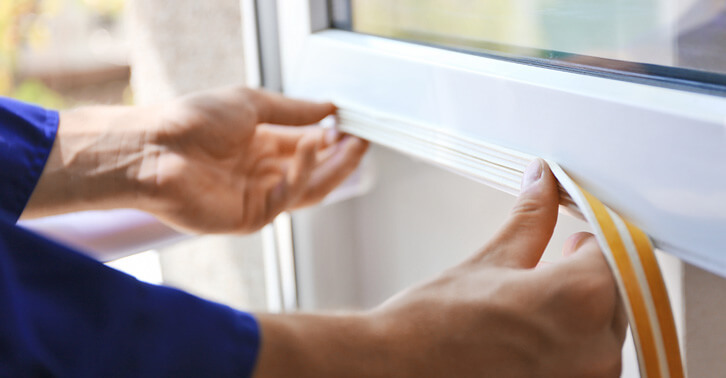 In addition to replacing old an ineffective weather stripping, you can also buy window insulation kits online or at your local home improvement store. These kits include a plastic shrink film that can be applied to the interior of your windows. Most window film insulation kits require a hair dryer to shrink the film and get rid of all your wrinkles. While window insulation kits can help you save money and energy without spending thousands of dollars on thicker, weatherproof windows, some homeowners hate the way they give your windows a cloudy, shrink-wrapped look. We recommend testing them out on a window you don’t use very often first before adding them to more windows in your home. Shades and blinds can make a huge difference for your home’s energy costs. Cellular shades, sometimes referred to as honeycomb shades, are the most energy-efficient type of window shade that you can install. Cellular shades not only look beautiful; they also allow light to stream through while also providing you with significant energy savings at the same time. Consider installing cellular shades to keep your home cool in the summer and warm in the winter. There are many different cellular shade options, including pleat sizes, single/double/tripe cell shades, colors, fabrics, black-out, and additional upgrades. 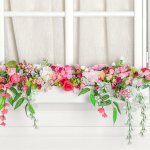 Typically, larger pleat sizes are more energy efficient since they can trap more air, however, they may not look right for smaller windows. For the greatest insulation capacity, go with triple layer cellular shades. Speak with window treatment specialist for the best window coverings for your home. You can find window treatments at your local home improvement stores, such as Home Depot and Lowe’s. They can cut your shades to size and you can install them yourself, or they can send a professional installer to your home. For the best looking windows, both from the inside and outside, use drapes in addition to shades. They are mounted on the outside of your shades and give your windows an elegant and luxurious look while increasing efficiency and options for light streaming through the windows. You can purchase black-out curtains or add a thermal lining to the back of the draping for additional energy efficiency. In addition to saving energy and money, layering window treatments on top of each other will also reduce outside noise, interior echoes, and improve the look and feel of your home, inside and out. Cellular shades and drapes or inside-mounted shutters and drapes are the most popular combination window coverings. Keep in mind that black-out curtains and thermal backings will block out a lot of light. For the greatest energy-efficiency, consider outside-mounted shades, shutters, awnings, louvers, vertical fins, and even trees and plants. They block unwanted heat from the sun in summer and cold winds in the winter before hitting your windows. When choosing outdoor window coverings, consider a lighter color to reflect the sun’s rays in summer. There should also be a gap between the awning and the side of the home to vent accumulated heat. Learn more passive heating and cooling window strategies. Trees not only provide shade from the hot summer sun, they also provide valuable protection from strong winter winds. For the greatest winter energy savings, plant evergreen trees on the north and northwest sides of your home. Learn how to strategically plant trees around your home for the greatest summer and winter energy savings. Click here for more winterization and energy-saving projects. Don’t forget to schedule your heating tune-up for winter! Sign up for our MVP (Maintenance Value Plan) so you never forget about important HVAC maintenance. If you have any questions or concerns, Ask a Champion.